Your immune system produces immunoglobulin E (IgE), a specific class of antibody. IgE circulates through the blood and works against specific substances, but typically not against foods that we eat. A person's ability to form IgE specific to something as benign as food is an inherited predisposition. Generally, such people come from families in which allergies are common -- not necessarily food allergies, but perhaps hay fever, asthma, or hives. Someone with two allergic parents is more likely to develop food allergies than someone with one allergic parent. 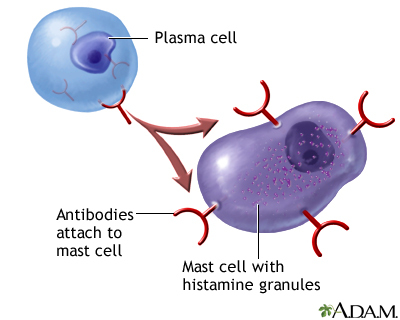 The food-specific IgE then attaches to mast cells. These cells are in all body tissue, but are more often found near sites of allergic reactions, such as the nose, throat, lungs, skin, and gastrointestinal (GI) tract. If your immune system tends to form IgE to certain foods, you must be exposed to the food before you can have an allergic reaction. When you digest this food, it triggers your body to produce a food-specific IgE in large amounts. The food-specific IgE attaches to the surfaces of mast cells. In the future, when you eat that food, it interacts with food-specific IgE on the surface of the mast cells and triggers the cells to release chemicals such as histamine. Depending upon the tissue in which they are released, these chemicals will cause you to have various symptoms of food allergy. Food allergens are proteins within the food that enter your bloodstream after the food is digested. From there, they go to target organs, such as your skin or nose, and cause allergic reactions. An allergic reaction to food can take place within a few minutes to an hour. The process of eating and digesting food affects the timing and the location of a reaction. When the allergens reach your lungs, they may cause asthma. 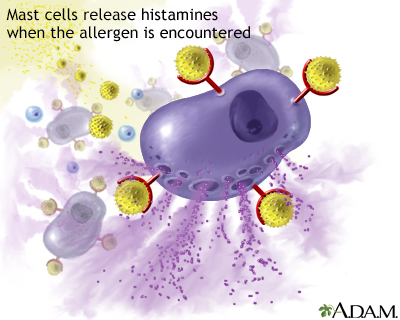 Created by the National Institute of Allergy and Infectious Diseases. Modified and updated by A.D.A.M., Inc. Illustration copyright A.D.A.M., Inc. Reviewed By: Paula J. Busse, MD, Assistant Professor of Medicine, Division of Clinical Immunology, Mount Sinai School of Medicine, New York, NY, Review provided by VeriMed Healthcare Network. Also reviewed by David Zieve, MD, MHA, Medical Director, A.D.A.M., Inc.